Philadelphia is full of architectural marvels. 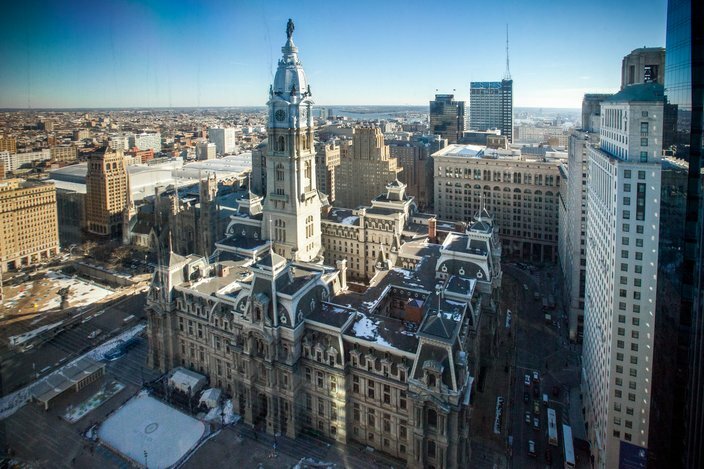 Philadelphia is a mosaic of different architectural styles, from Federal-style row homes to Art Deco-inspired skyscrapers. It would be impossible to see it all in a day, or a week, but a curated biking or walking tour gives tourists and natives alike a good grasp on what the city has to offer. 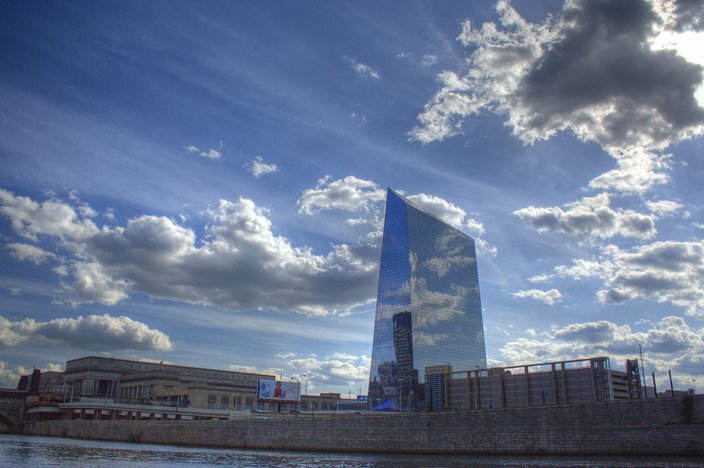 Below we've compiled a list of 15 must-see buildings in the City of Brotherly Love. The interactive map provided marks each stop on the tour. The total circuit measures nearly eight miles. If you're active enough, you could see every stop (and more) in just over three hours. If not, try following just one of the two legs provided, labeled Route A and Route B. A list of fifteen spots naturally leaves out dozens of amazing spaces. Many sites along the walking tour below pass by or are right around the corner from more legendary structures, so feel free to stray from the path and explore. Photo by R. Kennedy for Visit Philadelphia™. This is the nation's oldest continually inhabited residential street, and as such features gloriously crafted brick structures that date back to the 1720s. A few times a year, the neighborhood lets curious visitors peak inside the occupied homes. Photo by G. Widman for Visit Philadelphia™. On your way here you'll pass the beautiful Christ Church and Franklin Court, where Benjamin Franklin lived. The gleaming glass prism of NMAJH which faces Independence Mall alludes to the museum's accessibility and contrasts nicely with its big terra cotta structure. At night, the front lights reveal what's inside. Philadelphia History Museum, 15 S. 7th St. 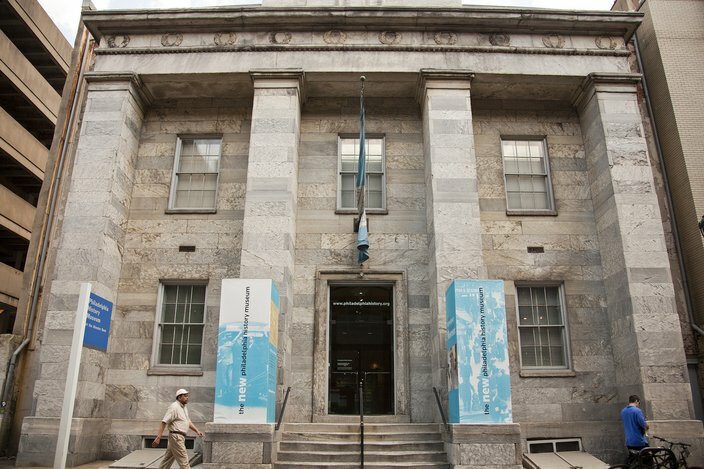 This Greek Revival structure first housed the Franklin Institute from 1826 and was built by John Haviland, a renown architect who also designed Eastern State Penitentiary. 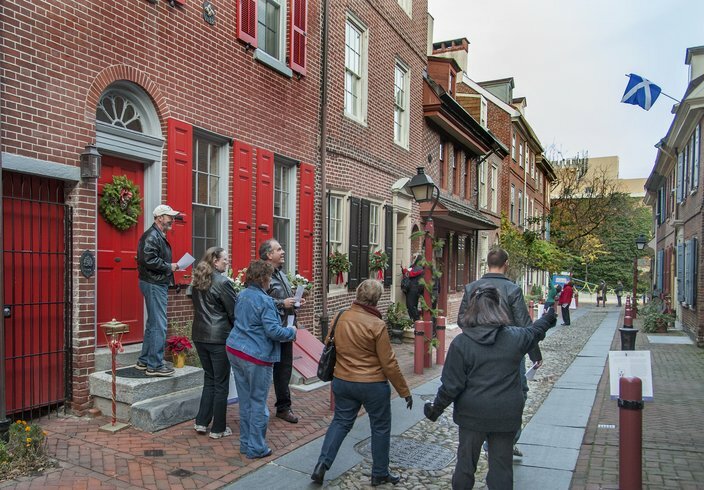 Between the History Museum and NMAJH, you'll pass by Independence Mall, Independence Hall and the Liberty Bell. Loews Philadelphia Hotel, 1200 Market St.
Photo by Flickr user C. M. Keiner. Commonly referred to as the PSFS Building, this site originally housed the Philadelphia Savings Fund Society but opened as a Loews Hotel in 2000. Built in 1932, it was the country's first International Style skyscraper and is known for its blazing neon topper. The Wanamaker Building, 1300 Market St. 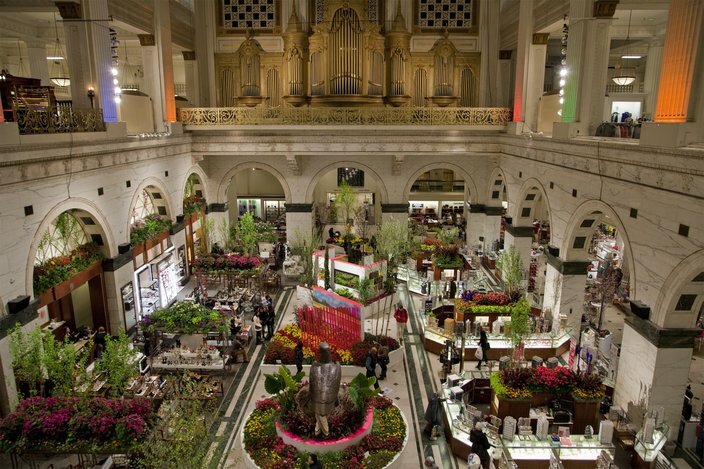 This Italian Renaissance-style structure originally housed Wanamaker's department store, the first of its kind in Philly. Wanamaker's has since turned into a Macy's, but the vast interior Grand Court's beauty (and function) remains intact, as does its antique pipe organ. 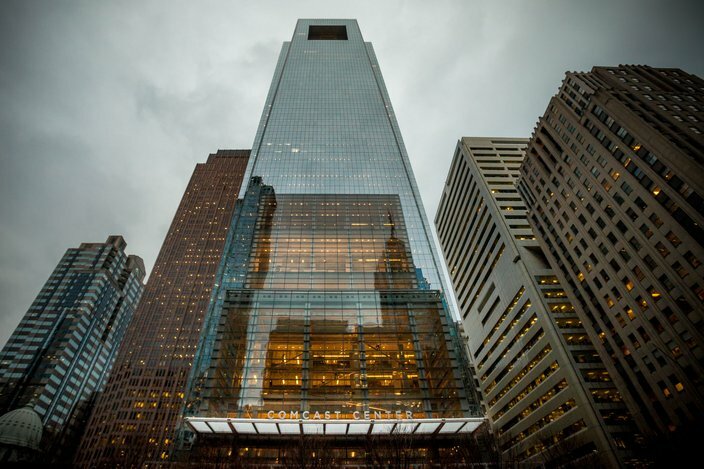 Comcast Center, 1701 John F. Kennedy Blvd. Photo by Thom Carroll, PhillyVoice. Walking past the iconic Love Park (soon to get a redesign), make your way toward JKF Boulevard and you'll find Philly's tallest building - for now. 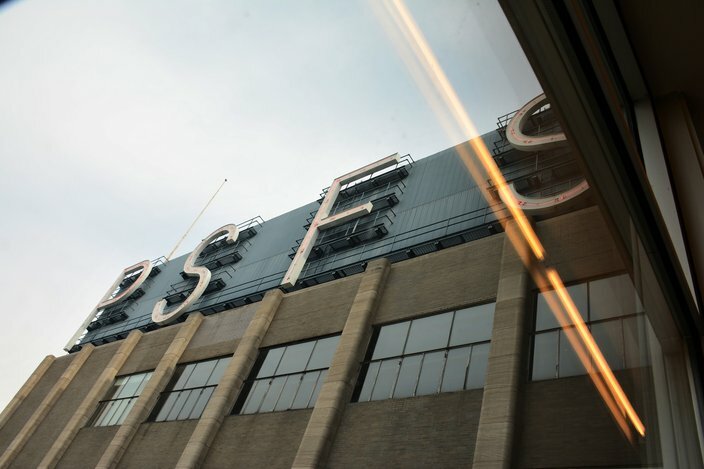 Make sure to walk inside the shining glass structure to see the Comcast Experience, a 2,000 square foot LED screen show. The Barnes Foundation, 2025 Benjamin Franklin Pkwy. 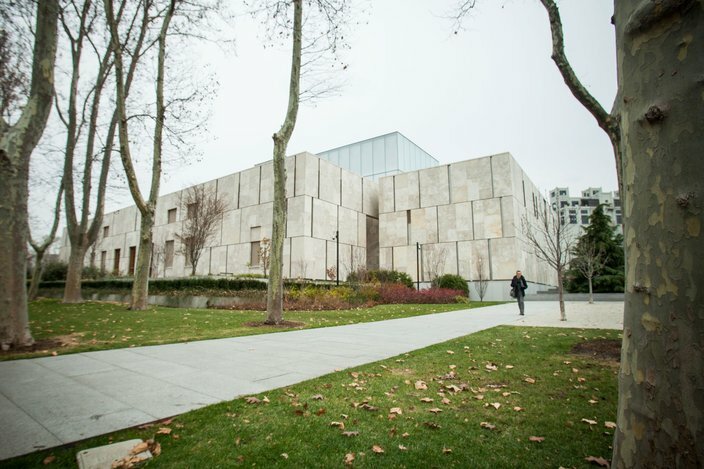 This campus of the Barnes Foundation plays host to the collection of post-Impressionist and early modern artworks started by Albert C. Barnes. 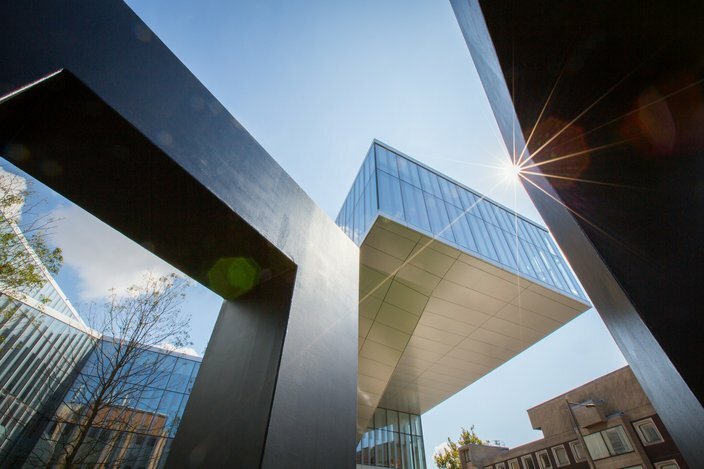 But the modern structure, by Tod Williams and Billie Tsien Architects, is as breath-taking as the art within. 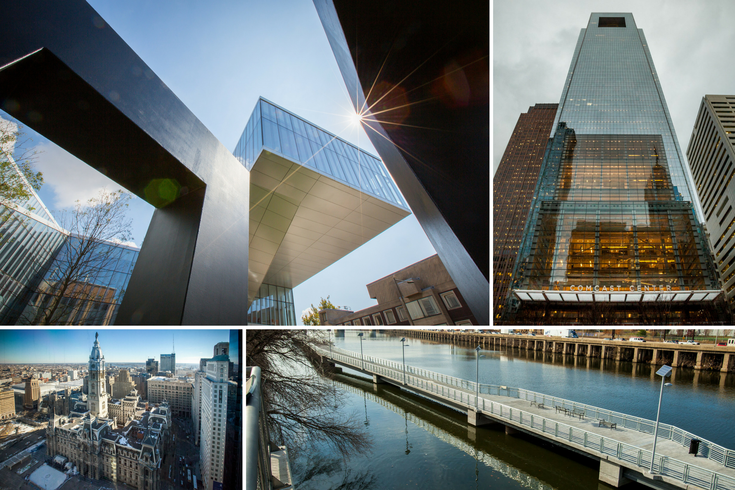 Cira Centre, 2929 Arch St.
Photo by Flickr user Michael W. Murphy. Heading down 20th Street toward JFK Boulevard you'll pass Logan Square and the hulking Franklin Institute. Once in front of the sunset reflecting, César Pelli-designed living crystal we call the Cira Center, you'll understand why it inspires so many Instagrams. 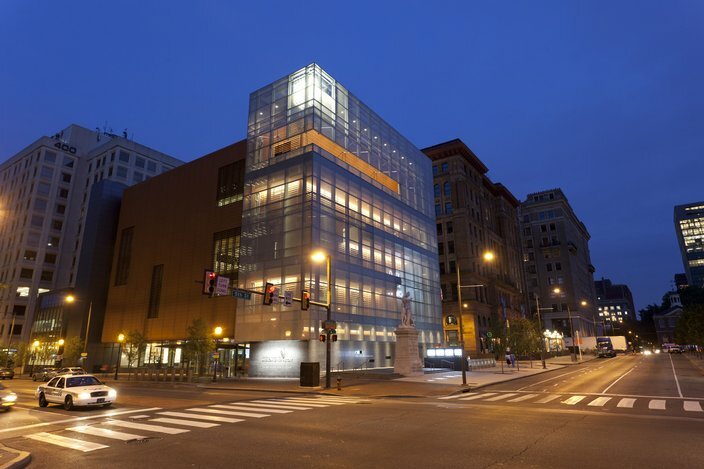 Paul Peck Alumni Center, 3140 Market St.
Photo courtesy of Drexel University. On your way into University City, you'll pass 30th Street Station, an architectural legend in its own right. 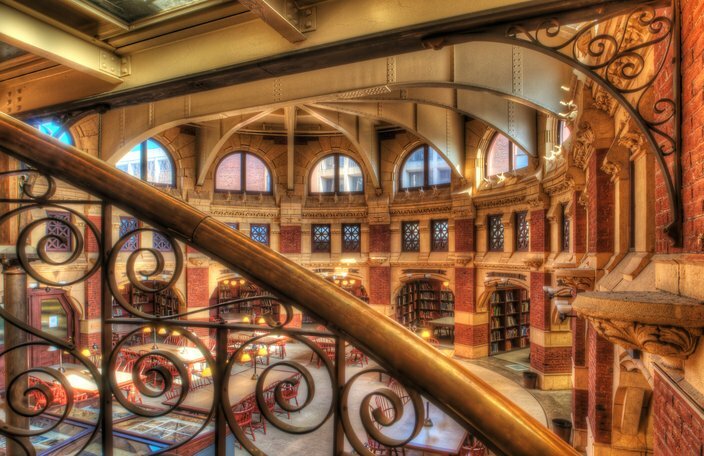 Once inside you'll stumble upon famed Philly architect Frank Furness's 1876 Victorian-style Centennial National Bank, now quirkily squatting on Drexel's modern urban campus. Krishna P. Singh Center for Nanotechnology, 3205 Walnut St.
Photo courtesy of the University of Pennsylvania. After passing by Drexel's historic Main Building, you'll find a high contrast in Penn's Singh Center. With a facade as futuristic and sleek as its function suggests, the building's gravity-defying eastern wing is a scientific feat on its own. Fisher Fine Arts Library, 220 S. 34th St.
Another Frank Furness creation, this castle-like library is the stuff of every bookworm's dreams, inside and out. It even features literary inscriptions on select stone surfaces chosen by Furness's brother, a Shakespearean scholar and Penn faculty member. 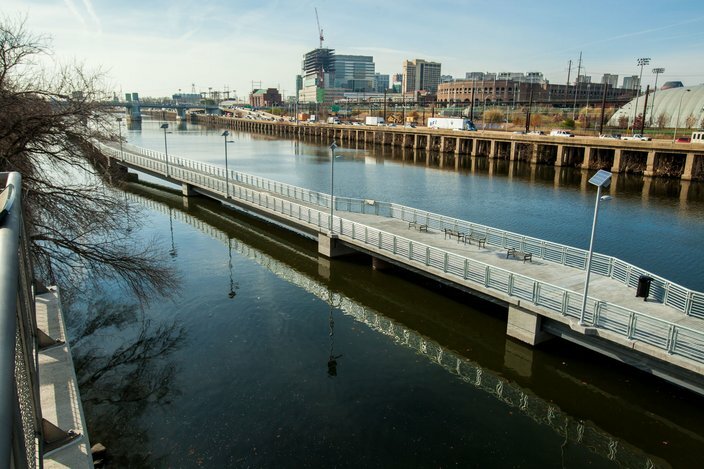 A visit to the Schuylkill River would be remiss without a trot down the new boardwalk. Though not a building, its clever landscape architecture extends the Schuylkill River Trail beyond Locust Street for more running and walking. The Art Institute of Philadelphia, 1622 Chestnut St.
Photo by Flickr user Ferd Brundick. Take a trip down Locust and through picturesque Rittenhouse Square on your way to The Art Institute. 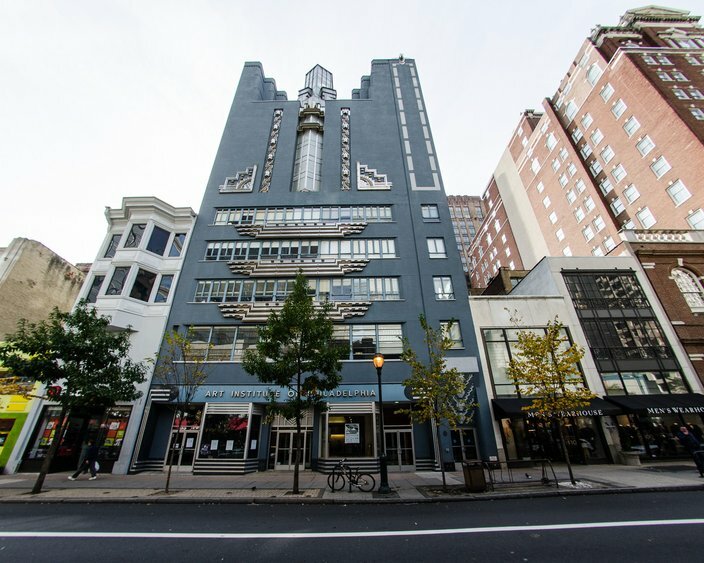 Its exuberant circa 1934 art deco exterior harkens back to its first use as the home of WCAU radio station. Photo by B. Krist for Visit Philadelphia™. 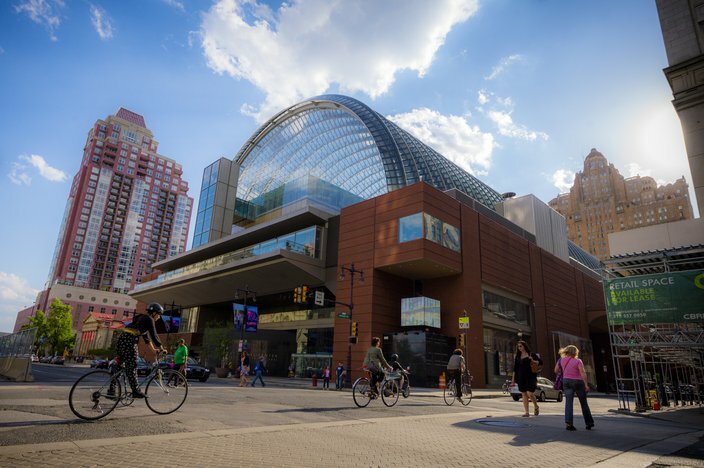 It's hard to miss the Kimmel Center once you're on the Avenue of the Arts. The block-wide structure houses two independent theater structures, a rooftop garden, a cafe and public plaza all under a huge steel and glass barrel vault roof. City Hall, 1401 John. F. Kennedy Blvd. 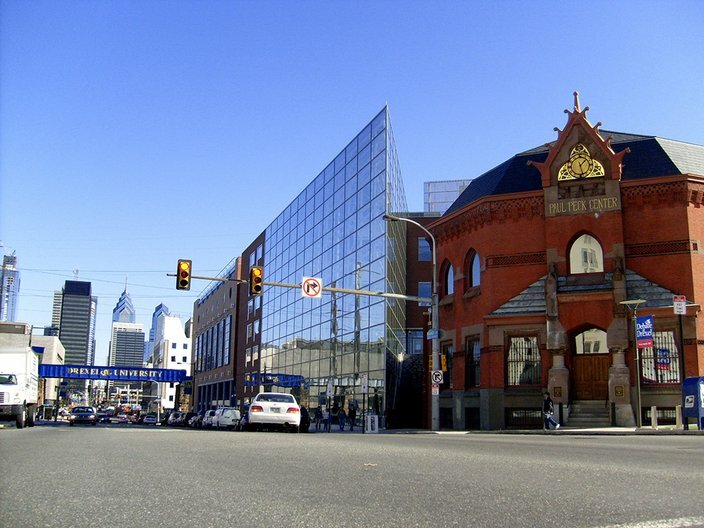 The Second Empire style structure took 30 years to build (1871-1901) and features a 37-foot tall statue of William Penn that weighs over 53,000 pounds. Be sure to stay awhile, walking in and out of the courtyard, checking out Dilworth Park and heading up to the observation deck.